Learn how to make Vanilla Ice Cream Recipe | Easy No-Churn Homemade Ice Cream recipe with step-by-step video tutorial. 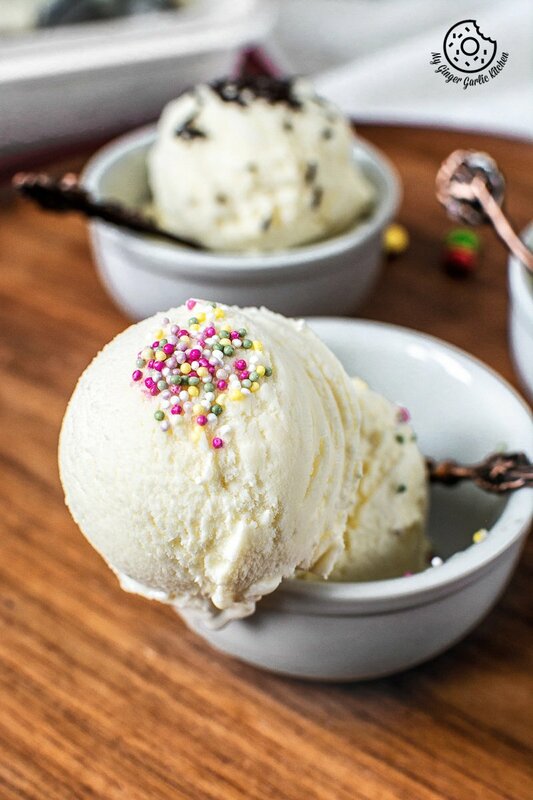 This no-churn vanilla ice cream recipe has all the richness of traditional ice cream recipe, but this easy and fast version requires only 10 minutes of work. This particular recipe makes a silky, rich, smooth, and velvety ice cream which tastes exactly like the ice cream you get in your favorite ice cream parlor. Hey dear friends! I hope you are enjoying this summer-ish climate. For me, I am positive that this year it’s gonna be a great summer. Vibes are telling me that we would be fortunate enough to witness the mostly sunny but not too hot summer this year. Also, I would be enjoying lots and lots of homemade ice-cream this year. Well, there is no certain time to whip up some ice cream. This very simple yet most delectable vanilla ice cream would surely help you to cool off on such days when the mercury rises higher. 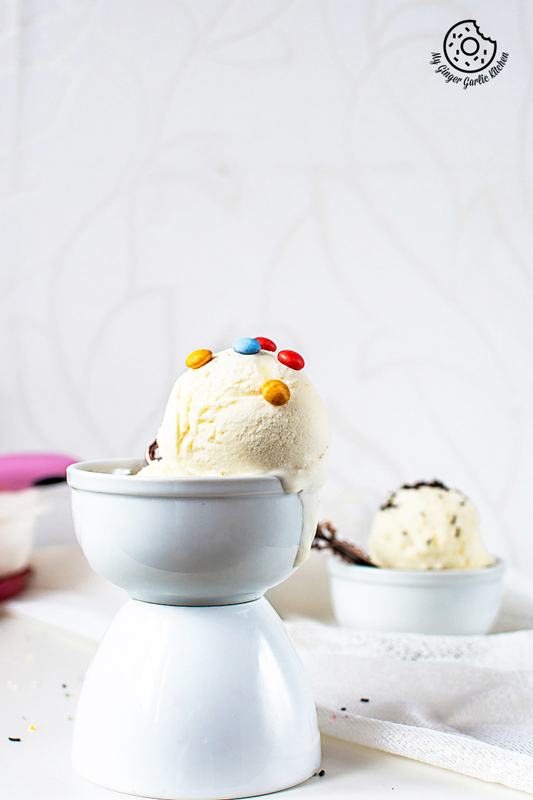 You don’t have ice cream maker and still want to make the ultimate vanilla ice cream at home? No issues! 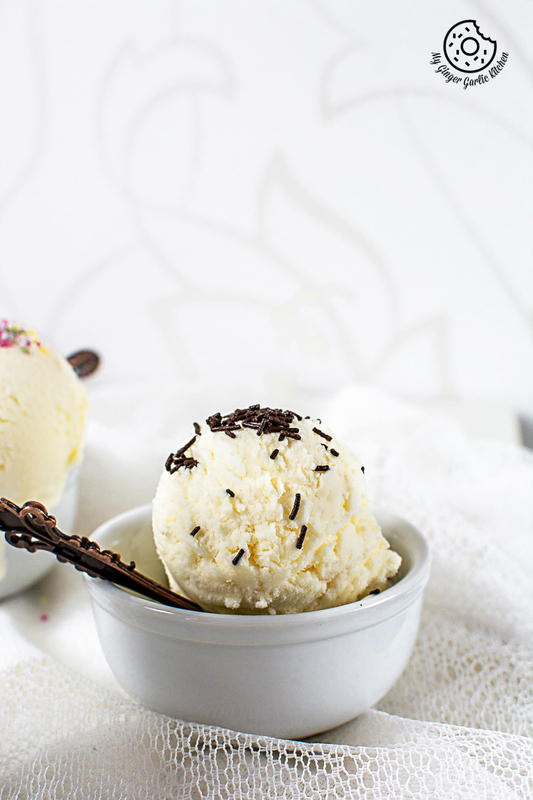 I will show you how to make the most smooth and creamy egg-free vanilla ice cream. 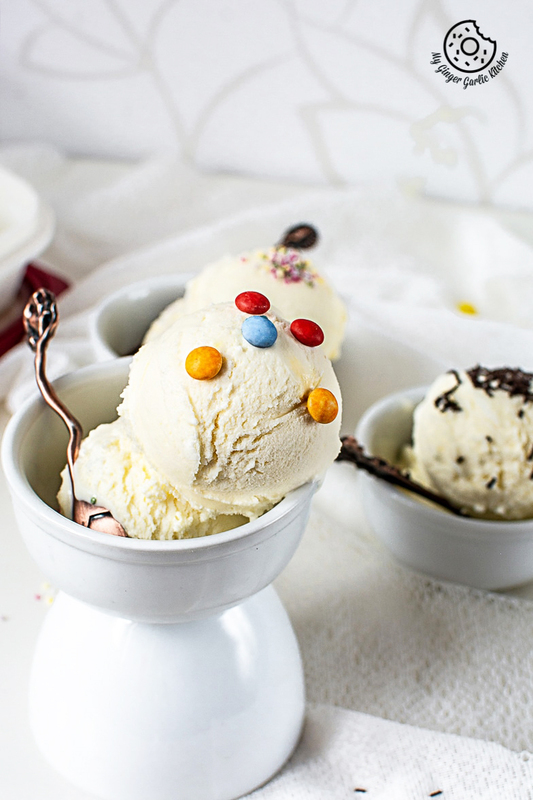 You can make this homemade ice cream without needing a special ice cream maker appliance. And you certainly don’t need any other fancy pieces of equipment for making this. With this effortless recipe, you can simply make this homemade vanilla ice cream with a hand mixer. And if you don’t have it then you can still make it in a blender. YES, you heard me right — a BLENDER! 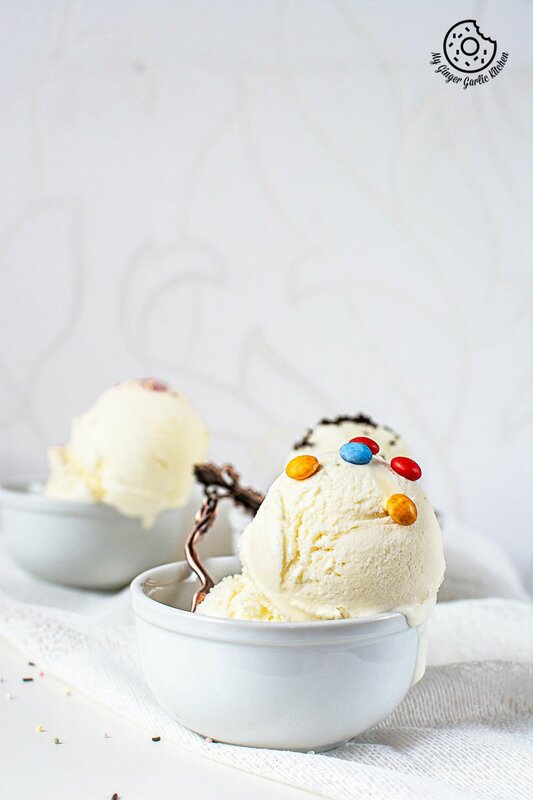 All you need for making this satisfying vanilla ice cream is just 3 simple and basic ingredients which are easily available in any kitchen. You guys must know that I love homemade ice creams and I have a lot of homemade ice cream recipes on this site. But recently I have been getting a lot of requests for sharing my ‘no-churn vanilla ice cream recipe’. So here goes the recipe. I know why some people go nuts over a simple vanilla ice cream. And why not? You just can’t beat it for richness and exotic vanilla flavor. Remember 2 weeks ago, I posted this no-churn butterscotch ice cream recipe. Everyone in my home including myself is going crazy for this nutty butterscotch flavored ice cream. If you don’t like no-churn ice cream, then I have to warn you that you might have to change your opinion after trying this ice cream. Because this no-churn creamy and smooth ice cream would turn out so darn good. I tried this so many times with different flavors and it always works. 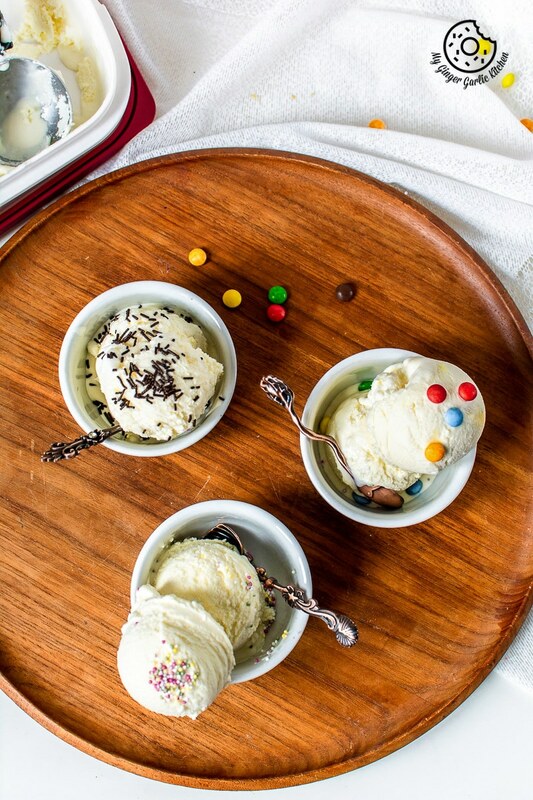 You don’t need a special ice cream maker appliance to make homemade ice cream. There’s 10 minutes of extra labor involved when compared to store-bought ice cream, but believe me that little 10 minutes of easy work is worth it all. My super easy step-by-step video tutorial makes it even simpler. You can whip up a batch of no-churn ice cream every time the ice cream craving strikes. Depending on the flavor you want to create, you only require some basic ingredients. What’s the difference between churn and no-churn? If you’re not acquainted with the ice cream making process, then this info is for you. There are two basic ways of making ice-cream — The old-fashioned churn way, and modern no-churn way. Ice Cream the Churn Way: This is the traditional way, where the egg custard is cooked first, cooled and then slowly churned in an ice cream maker machine. 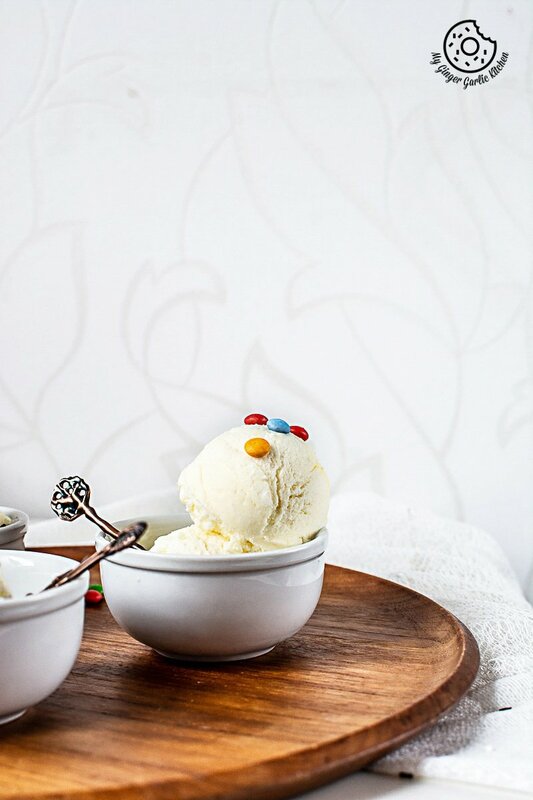 Ice Cream the No-Churn Way: This is a modern, handy and shortcut way. 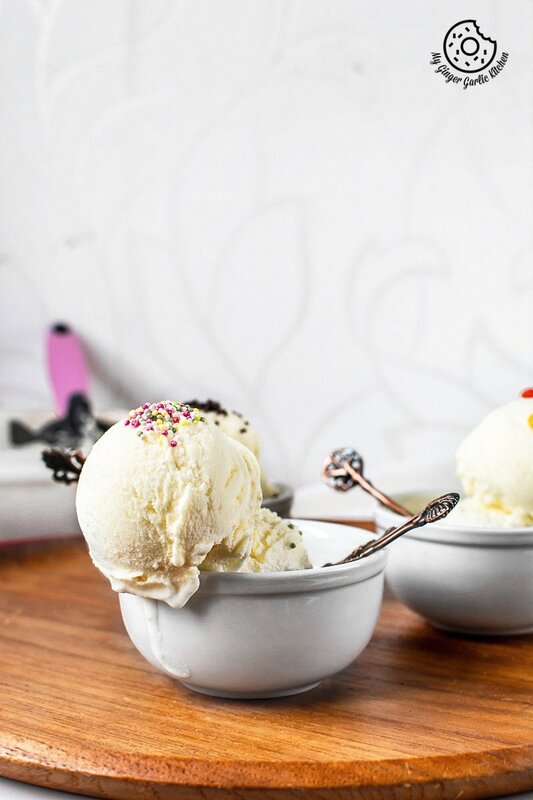 With this method, ice cream can be ready in minutes of hand-work + freezing time. Homemade everything is better than the store-bought stuff because the fresh food made with love is incomparable. The same theory applies to homemade ice creams. One of the main reasons I prefer with the homemade ice cream over store-bought is the customized flavors. You can simply go wild and play magic with your own imaginations. The homemade flavors are always incredible, you just can’t beat them. You could brighten the flavors up the way you like. You can add some freshly cut fruit chunks, fruit jam or puree. You can also add some chocolate, coffee, dried fruits, or nuts. You can even add some candies, cookies or even brownies. Sky’s the limit. You will only need sweetened condensed milk and heavy whipping cream as your base ingredients. Simply whip the chilled cream until stiff peaks form, fold in sweetened condensed milk, and add the vanilla extract. Fold again. DONE. I added vanilla extract, but you can also use the vanilla bean. Once you’ve folded all of your ingredients together, just pour this cream into a freezer-safe container and freeze for 2 hours. Stir. Freeze again for 6 hours. Once it has frozen, just scoop, and add your favorite toppings. And ATTACK. 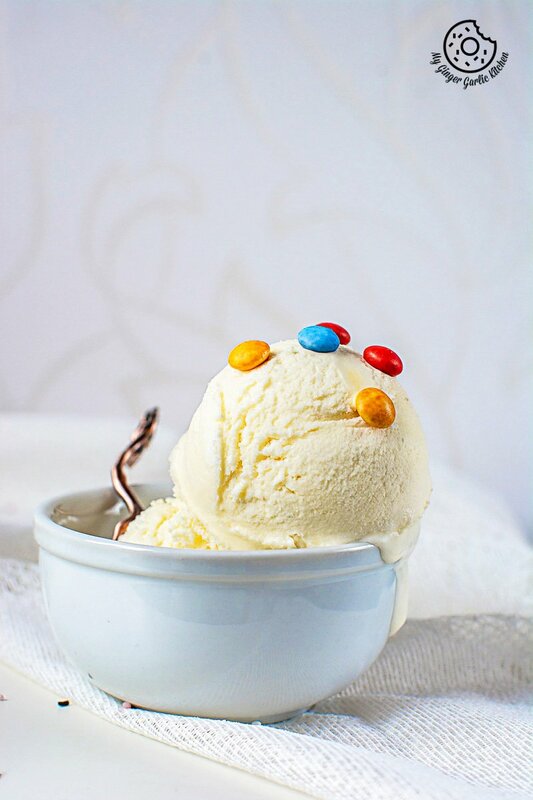 Try this super simple No Churn Vanilla Ice Cream recipe at home and I am sure that you’ll love it as much as I do. 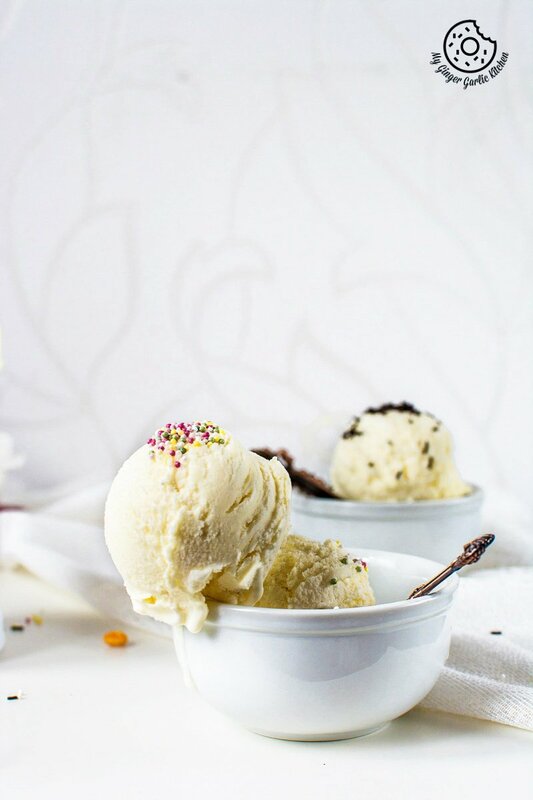 This no-churn vanilla ice cream recipe has all the richness of traditional ice cream recipe, but this easy and fast version requires only 10 minutes of work. This particular recipe makes a silky, rich, smooth, and velvety ice cream which tastes exactly like the ice cream you get in your favorite ice cream parlor. 2. Add 2 cups chilled whipping cream to the refrigerated mixing bowl. 4. Add the sweetened condensed milk and vanilla extract. 11. Scoop out ice-cream in a cup or cone. 12. Top with some your favourite toppings and serve.